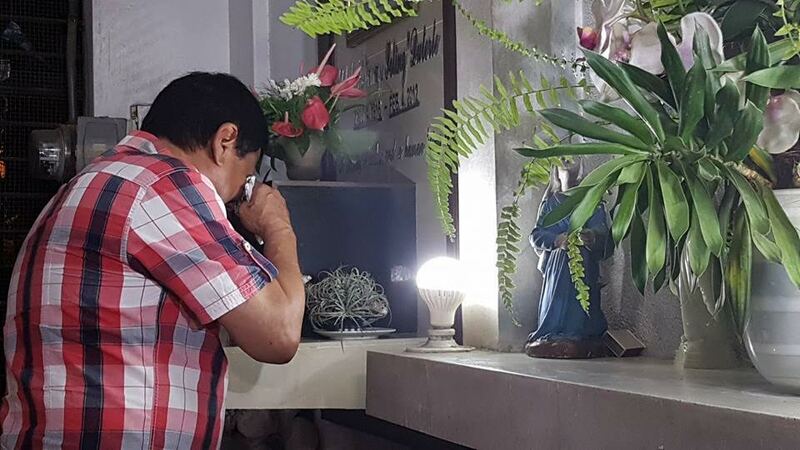 MANILA, Philippines- Presidential frontrunner Mayor Rodrigo Duterte was seen weeping during a visit to the tombs of his parents, Vicente and Soledad, on early morning of Tuesday, May 10, a day after the national elections. Hours after the partial election results point to his victory, Duterte broke down to tears at his parents’ graveyard while asking them to help him rally the country. A Facebook post by Edith Ging Z. Caduaya showed photos of the apparent president in a rare emotional moment. “The upcoming 16th President of the Republic, Rodrigo Duterte broke into tears as he asked his parents to help him rule the country,” Caduaya wrote in the caption of the post. His parents, Vicente, served as the governor of Davao, while Soledad was a school teacher. With a significant lead over his opponents and 91.16% of precincts already accounted for, Duterte is set for a big win in the 2016 National Elections. Based on the unofficial and partial results from the Commission on Election’s transparency server, Duterte has amassed 14,680,126 million votes or 36.6% of transmitted votes as of 3:08 am on Tuesday, May 10. Now that the tough talking mayor from Davao City is considered the presumptive winner of the 2016 Philippine presidential race, he is finally set to break the “Mindanao curse”. While 12 out of the country’s 15 presidents hail from Luzon, only three are from Visayas namely Sergio Osmeña, Carlos Garcia and Manuel Roxas. According to political analyst Prospero de Vera, Duterte’s victory changes traditional belief that only aspirants from Luzon and Visayas can win the presidential race. However, de Vera also pointed out that Duterte’s historic win brings the challenge of changing Mindanao dramatically.